The story is set in the C16th during the Momoyama Period of Japanese history [‘warring states’]. A band of rōnin (masterless samurai) are recruited to defend a village from marauding bandits. The prime focus of the film are the samurai warriors, each carefully delineated and offering a particular aspect of the code and skills of this warrior class. Just a few of the villagers are delineated in an equal fashion but the contrasts between these two usually very separate classes is presented with great skill and clarity. “[Its] universal appeal is partly because of the humaneness of the film’s characters. Each of the seven samurai is a distinct individual but never a caricature, about whom we come to care a great deal. It is a period in which the samurai class is declining. The rōnin samurai roam the countryside looking for work, but some have also become bandits. Because working for farmers would be below them, they kick aside the villagers seeking their help. What makes these seven samurai honourable is their continued adherence to the spirit of the samurai’s code of Bushido which allows them to reach past the class consciousness that normally separates knights from peasants.” (Beverley Bare Buehrer, 1990). The early stages of the film depict the setting and the recruitment of the band and then their preparations for the defence of the village. And then in a long and detailed and dramatic section we watch as the battle ensues. This is one of the great presentations of samurai action but equally it is one of the great representations of armed conflict. The film contains innumerable famous sequences spread across the narrative. Early on we watch as the samurai leader Kambei (Shimura Takashi) rescues a kidnapped child and then a demonstration of Samurai swordsmanship by Kyūzō (Miyaguchi Seiji). This varied group includes characters who are not traditional samurai; notably Kikuchiyo (Mifune Toshiro ) who later in the film give voice to the conflicting values of peasants and samurai. The final battle, which takes place in torrential rain, is a marvel of design, staging, cinematography and editing. And there is traditional musical accompaniment, not always the case in Japanese films. The whole film is one of the finest productions directed by the master Kurosawa Akira. This is an outstanding example of his use of landscape within which are to be found fascinating and very human protagonists. The use of the telephoto lens and multi-camera techniques for much of the action gives distinct and very effective visualisation. Seven Samurai is as famous as a model for Hollywood. The most well-known copy is The Magnificent Seven (1960, itself remade in 2016). Roy has some interesting comments on the Kurosawa film in a post on the 2016 remake. That is not up to the 1960 original: the latter is a good western but no substitute for the original. And, for me, the three hours fly by. A film that ‘launched a thousand’ replicas: not quite but there are sixteen plus Japanese remakes or sequels. There are also numerous US versions: the original was re-edited and dubbed for the US market. Among the changes the US version downplayed the dangers of nuclear weapons, a key theme in the plot. Forgiveness is obviously a Japanese characteristic since they have co-operated with the Yanks since then rather than initiating economic boycotts. The film was an expensive production by Japanese standards of the time. The film’s special effects relied on a skilled specialist Tsuburaya Eiji. I found the design of the production by Chuko Satoshi still convincing last time I saw the print. Tamai Masao’s black and white cinematography is finely done, [academy ratio]. The film’ soundtrack by Shimonaga Hisashi uses special sound effects. And the music by Ifukube Akira is especially effective. Director Honda Inoshiro orchestrates these talents into an excellent 98 minutes of action. Whilst techniques have moved on and developed in the intervening decades the film stands up really well. The script is by Murata Takeo and Honda Inoshiro and the plot develops at a fairly fast pace and offers character relations as well as a monster and large-scale destruction. It is also the type of film that looks better in a 35mm print. So happily Hebden Bridge Picture House is using this format for a ‘reel film’ screening on Saturday February 3rd. The last time I saw the film the print was in good shape. We enjoyed a good-looking 35mm print. The visual and aural special effects stood up well as did the monster and its rampages. Some of the plot is conventional but the recurring references to the US nuclear bombing of Japan are powerful. There is a reference to Nagasaki and a number of sequences that recall the horrors of 1945. There is also an interesting debate amongst the scientific characters about what should be done about the monster. Definitely a classic. This is a classic samurai film and enjoys the talents of two stars: filmmaker Kurosawa Akira and actor Mifune Toshiro. Both bring their special talents to an entertaining and exciting action movie. Like much of their work the film has been remade several times, including as a spaghetti western, A Fistful of Dollars (1964), and as a Hollywood prohibition/action film, Last Man Standing (1996). The film is set in 1860, just prior to the Meiji period and the rise of modern Japan. Mifune plays a ronin, that is a masterless samurai whose traditional functions have vanished and who takes on whatever work he can find. In this case in a small town he is offered work as a bodyguard (the English sense of the title) by rival merchants. The merchants are the emerging class in this period, but here they rely more on criminality than trade, forerunners of the modern Yakusa. The main character and the film’s story are strongly sardonic. The opening sequence shows our hero passed by a dog carrying a severed hand. And the violence implied here is a central right through the film. The cinematographer on the film was Miyagawa Kazuo. He had worked with Kurosawa on the earlier Rashomon (1950) as well as with other major directors like Mizoguchi Kenji and Ozu Yasujirô. As in some of the director’s other films Kurosawa and Miyagawa make great use of the telephoto lens. There is a depth of field in the shots, but a rather flat image as the action is foreshortened. Among the distinctive editing techniques, performed by Kurosawa himself, are frequent wipes, a technique rarely seen in post-war (WWII) cinema. And the music track by Satô Masaru uses distinctive instrumentation including wood blocks. Kurosawa had set up his own production company. The first film was a variation on Shakespeare’s ‘Hamlet’, The Bad Sleep Well / Warui yatsu hodo yoku nemuru (1960). Mifune was the lead actor. Yojimbo was the second film from the company . Both film were also scripted by Kurosawa. The film was popular in Japan and Kurosawa made a sequel titled with the character’s name, Sanjuro (1962). Once again Mifune played the lead. Yojimbo had a relatively large international release and has remained a regular title for revivals over the years. On its initial release in the Britain the BBFC gave it an ‘A’ Certificate. The film’s format was black and white TohoScope. almost identical to CinemaScope with an aspect ratio of 2.35:1: with Perspecta Stereo sound., Now Hebden Bridge Picture House are screening the film in their ‘reel film’ series on Saturday January 6th. So it can be seen in its original 35mm format: what a treat. Hebden Bridge Picture House are screening a 35mm print of the 2005 restoration of this Soviet Classic. The screening is supported by the Cinema For All – Yorkshire (Group). This is a rare chance to see the film in its original form rather than just on digital. The screening will enjoy a piano score by Darius Battiwalla, an experienced accompanist who impressed audiences in the now sadly defunct National Media Museum ‘silent with live music’. The Picture House, recuperated after the floods of 2016, now has a new 35mm projector. The introduction will place the film in the context of the seminal Soviet Montage Movement and, importantly, of the revolutionary society ushered in by The Great October Revolution, which Centenary occurred in the last few weeks. The Hebden Bridge Picture House‘s Open Day was on Saturday September 10th. This was also the final screening on the cinema’s long-serving Kalee 35mm film projector. For a while now the projector team having been nursing along this 65 year old machine, including some running repairs to keep the films on screen. The projector is now retiring: a suitable home for old but capable machines. 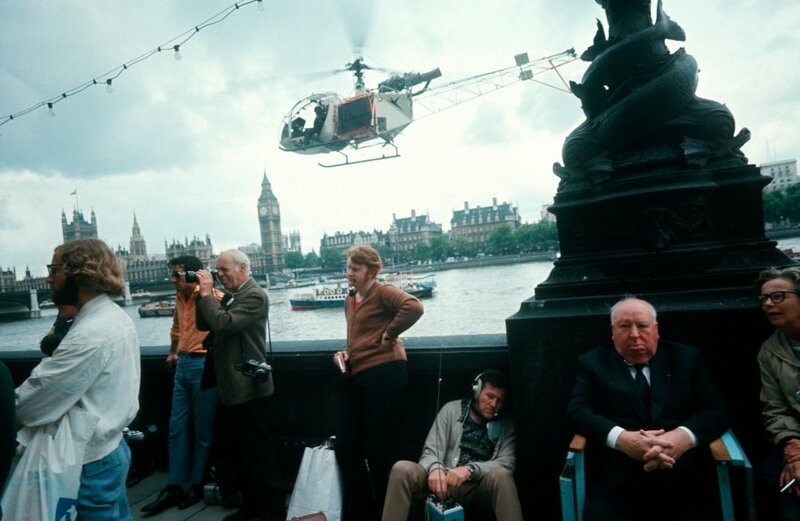 Appropriately enough the final title screened on the Kalee was Alfred Hitchcock’s last British film, Frenzy (Universal Pictured, 1972). Filmed in and featuring London it was shot in colour and standard widescreen. It is the most sardonic of Hitchcock’s films with Barry Foster in a stand-out performance as Robert Rusk, Convent Garden entrepreneur and serial killing psychopath. Jon Finch is capable as the victim/hero of the film, Richard Blaney. The film has some excellent London locations, photographed by Gil Taylor and Leonard J. South. It also has a screenplay by Anthony Shaffer adapted from the novel by Arthur Le Bern. Le Bern’s other famous novel is ‘It Always Rains on a Sunday’, provided the story for one of the finest East End representations from Ealing and Robert Hamer. Shaffer script has real drive but also some fine and witty lines, two concerning ties. The real victims in the film are Barbara Leigh-Hunt as Brenda Blaney and Anna Massey in a fine performance as Babs Milligan. There is also a fine cameo by Billie Whitelaw as Hettie Porter, suggesting an interesting sub-plot to the film. But the gallery of female victims marks this as one of the most overtly misogynous of Hitchcock’s films. Alongside the serial killer narrative we get an enjoyable minor plot around food: between Alex McGowan as Chief Inspector Oxford and Vivian Merchant as his wife. This adds another sardonic note to the scenario. It also features one of the many authorial motifs in the film: the familiar one involves a bowler hat.. There is a complete list of these in the excellent ‘Hitchcock’s Motifs’ (Michael Walker, Amsterdam University Press, 2005). Apart from ‘food and meals’ there are such interesting examples as handbags, mothers, and staircases. The staircase is a good example of the design, cinematography and editing of the film. At one point there is an impressive reverse track down a staircase and out into a Convent Garden street. A trope that Hitchcock perfected early in his career. And the film offers an intriguing variation on the serial killer’s labyrinth. The film was shot in Technicolor but distributors (in a typical false economy) printed the film up and circulated it on Eastman color stock. So the projectionist had to offer an apology before the screening for the ‘fading’ on the print. There was a definite pink tint on the film but there were only a few scratches and good contrast and definition. So we enjoyed most of the qualities of this film. Whilst not one of the great masterpieces directed by Hitchcock it does standout in the late titles that he worked on. It does, though, miss the hand of Bernard Hermann: the score is by Ron Goodwin, who appears to be trying to add a Hermann tone to the music, but without the Hollywood composer’s touch. The cinema is installing a replacement 35mm projector over the coming month. They hope it will be ready for a November screening. The new machine is a Victoria 5 and has been acquired from the old (and sadly defunct) Bradford Playhouse. This is the projector that operated in the smaller auditorium. Years ago I saw Ingmar Bergman’s Smiles of a Summer Night (1955) in that auditorium projected on that machine. This was the occasion that I realised that the film is one of the finest masterpieces directed the Swedish artist. I am looking foreward to seeing films of a similar quality at the Hebden Bride Picture House and screened from their ‘new’ projector’. Their regular presentation of films in their proper 35mm format is an example to other exhibitors in Yorkshire. Hebden Bridge Picture House are screening this M-G-M film in 35mm on Saturday August 5th. This is a delightful musical comedy starring Julie Andrews as Victoria (the key club performer in the film), James Garner as King Marchand (a Chicago Club Owner visiting Paris) and Robert Preston as Toddy, (a Paris night club performer). What makes the film especially effective is the way that it plays with cross-dressing, a classic source of comedy on film. The film was scripted and directed by Blake Edwards with music by Henry Mancini. The production is presented with excellent style and captures a certain image of Parisian night life. The cast, both leading players and supporting actors, are excellent and convincing in the role-playing within role play. The musical numbers are performances in Parisian night clubs including the raunchy Chez Lui. a musical comedy greatly influenced by the American model, with its choreographed sequences and parades, clusters of pretty girls that open up like bunches of flowers, . . . (Il Cinema Ritrovato Catalogue 2004). But it also retains some of the ironic treatment of gender representations that was rife in the earlier Weimar cinema, though more discreetly. The 1982 American version has little of the 1930s musical treatment, its offerings more like that of then contemporary musicals such as Cabaret (1972). There was a English-language remake in 1935, long before this form became a staple of Hollywood output. The film was directed by Victor Saville for Michael Balcon and starred Jessie Matthews. Set in the British Music Hall the film is less risqué than either the German original or the later Hollywood adaptation. It was screened earlier in the year at the National Media Museum, but from video. A shame as the BFI do have a 35mm print. The publicity was also feint, hence I missed it. There was an interesting accompanying exhibition using photographs from the Daily Herald archive, but that was also little publicised. Hopefully people will pick up on the screening of this latest version and turn up for what will be a very entertaining two hours plus. (134 minutes in colour and ‘Scope ratio). Hebden Bridge Picture House are screening this Warner Bros. classic this coming Saturday (June 3rd) in their ‘reel’ film slot. 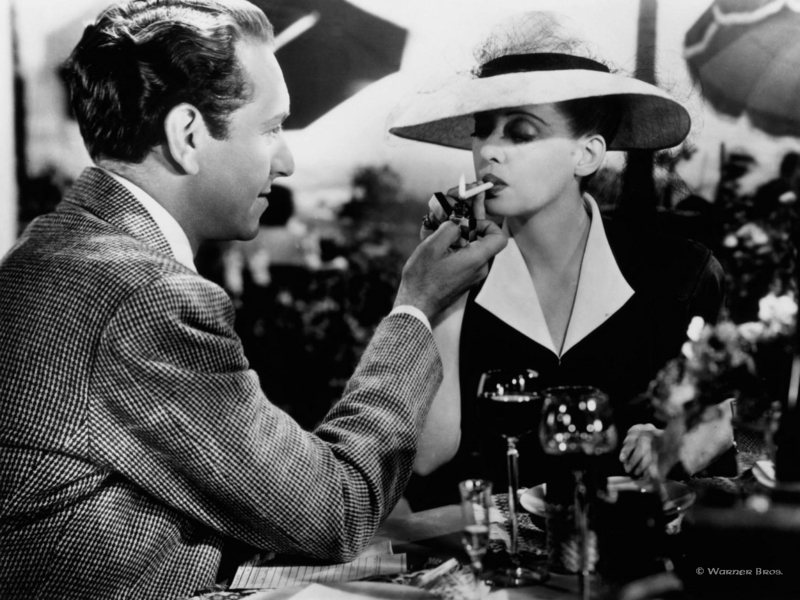 One reason alone should be enough to excite potential viewers, it contains, if not the finest, then certainly the most memorable performance by Bette Davis as Charlotte Vale. The films follows a transformation of this women worthy of Hans Christian Anderson’s famed story, ‘the ugly duckling’. And Charlotte at the beginning of the film is rather like a duck with a waddle, but by the climax of the film she is as regal as any swan. Along with this we have an excellent performance by Paul Heinreid as romantic object Jerry Durrance; debonair but capable of real passion. Claude Rains is his usual well-informed and analytical professional, Dr Jacquith. Gladys Cooper plays the repressive and dominant matriarch, Mrs Henry Vale, with real venom. Her title reveals the value system she follows. And Janis Wilson as the young and vulnerable object of Charlotte’s affection is good enough to warrant the credit she does not actually get. The film enjoys all the technical skills of the Warner Bros.’s production departments. Robert Haas does fine with the art design. Sol Polito, a talented cinematographer, varies the lighting and camera from dark interiors to sun drenched locales. And working alongside them is one of Hollywood’s outstanding composers, Max Steiner, providing a score at times dramatic and times lush. The film’s screenplay by Casey Robinson has one of those memorable lines that are quoted more often that the film enjoys screenings. The screenplay was adapted from a successful novel by Olive Higgins Prouty, who actually published three novels about the Vale family. This is a biopic of the famous C17th painter Michelangelo Merisi de Caravaggio. It was written (with Nicholas Ward Jackson) and directed by Derek Jarman. One can see why the gay sensibilities, homoeroticism and fine colour and design of the paintings would appeal to Jarman. As you might expect from this avant-garde artist this is not a conventional biopic. Jarman’s experimental and challenging style might seem a little daunting. Then it was screened at the National Media Museum in a 35mm print, presumably the same one screening on Saturday. The print was in good condition and looked great, especially in Jarman’s design and Gabriel Beristain’s colour cinematography [Fuji film stock processed by Technicolor] in presenting the artists and the art works. The BBFC gave it a 15 certificate, down from the original 18. Derek Jarman has dropped out of sight a little: I think the last retrospective was in 2014 in London. He remains a major contributor to British cinema and his best work, like Caravaggio, stands out and stands up to time. The print had a few more scratches but the definition, contrast and colour were all very good. An audience of seventy turned up for the film, which seems pretty good these days.